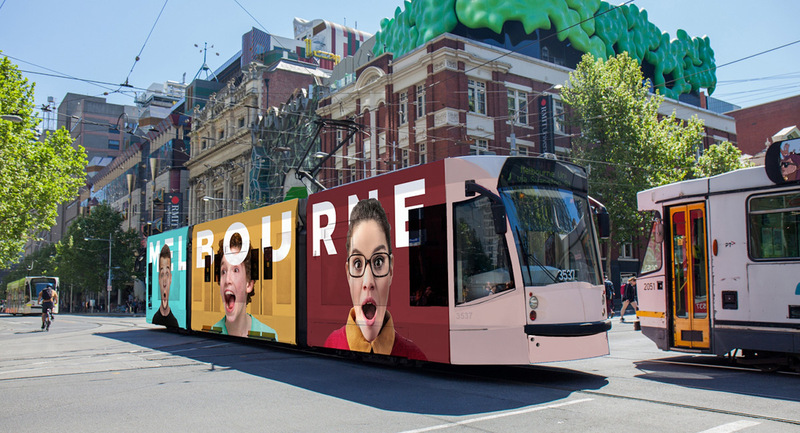 The Yarra Trams win was the most notable, taking the business from Adshel and APN Outdoor who split the advertising opportunities. However, the renewed Telstra contract is significant too – JCDecaux will install 1,800 new Telstra payphones with digital advertising screens over the next two years, representing the first major payphone redesign refresh since 1987. 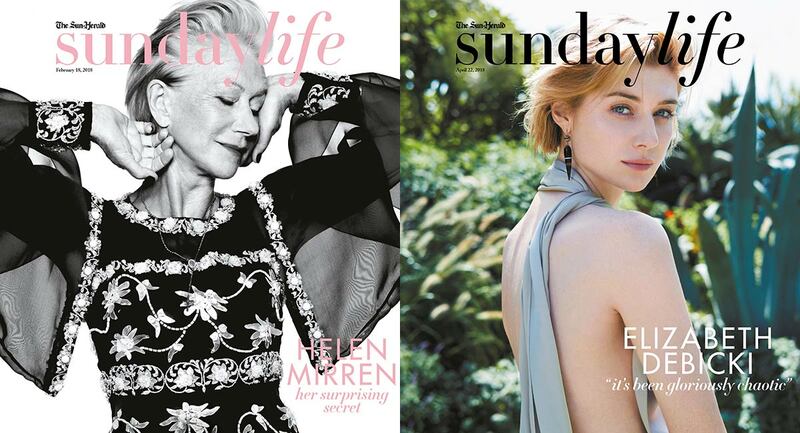 Fairfax Media’s newspaper inserted magazine Sunday Life is unashamedly female focused. 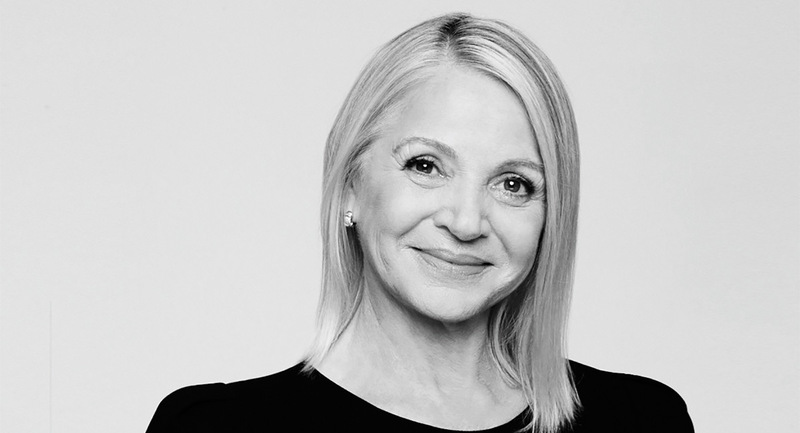 Editorial director Pat Ingram gave it this direction soon after she joined the title in 2011. “The readers of Sunday Life are slightly mature women, who are 40+. They are extremely well educated,” she told Mediaweek. “Fifty-five percent of our women are in the AB quintile, so she is affluent. This is what makes Sunday Life unique compared to other the newspaper-inserted magazines in the market, Ingram said. Marvel’s latest Avengers adventure remains at the top of the chart and it was the only thing stopping the weekend gross hitting a year low. The weekend total of $11.69m was the lowest weekend total since mid-March and only narrowly above the two weekends it narrowly beat. The relatively quite weekend at cinemas came ahead of the anticipated big business that Deadpool 2 and then Solo: A Star Wars Story could write over the next two weekends. An impressive total of $53.70m after just three weekends in cinemas. The movie shed 201 screens this week to 675 with a screen average of $7,870. The year’s other biggest performers have been Star Wars: The Last Jedi (which opened in late 2017) with $58m, Jumanji: Welcome To The Jungle on $48m and Black Panther with $40m. 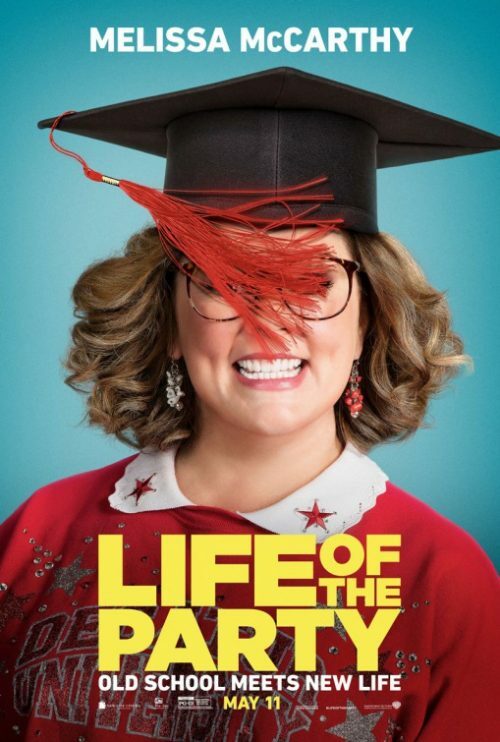 The only new release in the top five was the latest from Melissa McCarthy. 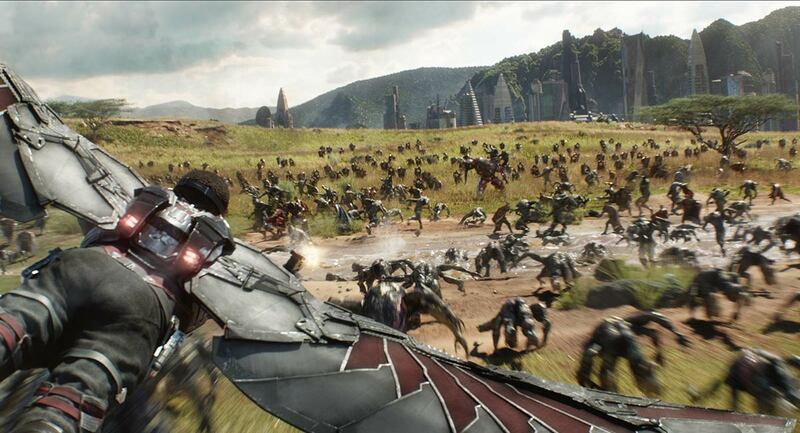 Opening on 297 screens, the movie had a screen average of $6,719. The second weekend of the Simon Baker-directed screen version of a Tim Winton novel remained on 240 screens with a screen average of $3,000. Gross to-date is $2.41m. After four weekends in cinemas the Amy Schumer release has taken $8.42m. It stays on close to 270 screens with a weekend screen average of $2,485. Very strong performance from this arthouse special with close to $5m so far and a screen average of $2,258 from 248 screens after four weekends. • Seven’s lowest Monday survey share – does House Rules need renovation? The commercial TV breakfast shows continue to battle it out across Britain. Nine’s Georgie Gardner lost her voice yesterday and Allison Langdon took over, throwing in a few cheeky gags including one about weddings Karl is anticipating as the Nine show broadcast from Covent Garden. Meanwhile Seven’s Sunrise stayed close to the Thames, broadcasting from The Anchor Southwark pub with an audience of young Aussies enjoying a late Monday drink. Home And Away was on 677,000 after a week 19 average of 692,000. 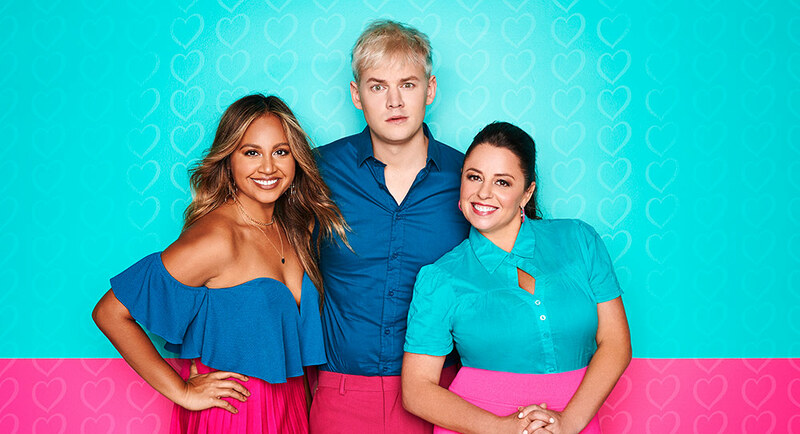 Jess and Jared returned to their South Australian reno on House Rules with 673,000 watching after 607,000 when the series launched a week ago. Josh and Brandon were clear at the top of the leaderboard, Leigh and Kristie sat at the bottom. While they are showing week-on-week growth, the numbers are still trailing the opposition. Seven has an opportunity to convert some viewers tonight with no episode of The Voice. Two sisters running a bakery called No Grainer were getting the makeover treatment from Mark Bouris on The Mentor. The business guru was making the bread rise, yet the audience, not so much. After 369,000 a week ago, the episode last night did 349,000. The Resident then did 174,000. A Current Affair had a strong start to the week with just over 900,000 after a week 19 average of 794,000. Laura Turner was reporting on the royal wedding and the show was offering viewers the chance to win Coles shopping vouchers. The second episode of the Battle Rounds on The Voice settled on the top 12. The coaches head to the live shows starting next Sunday with three contestants each. The Monday episode did 881,000 after 950,000 on Monday last week. Nine then repeated its Adele: Live In London concert where she also spoke to Graham Norton with 298,000 watching. The channel had its best share on any night since a Thursday in February where Celebrity and Gogglebox delivered a share of 17.0%. 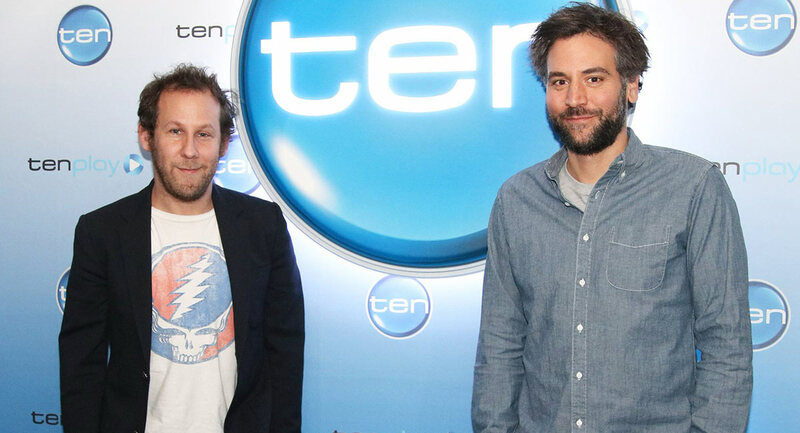 The Project ended with an appearance from the unlikely music duo of Ben Lee and Josh Radnor with the Aussie music star and the US sitcom star talking about their friendship and Aussie tour. The 7pm half of the show did 579,000 after an average of 524,000 last week, which was its best result since January. It was time for the second elimination on MasterChef with the three cooks baking a Maggie Beer recipe, which was then judged by the great lady herself. Samira did an outstanding job and was safe, with Metter being sent home as model-turned-writer Michelle Walsh dodged a bullet. The second Monday episode did 820,000 after launching on Monday last week with 890,000. The first episode of Have You Been Paying Attention? was a riotous affair with regulars Sam Pang and Ed Kavalee joined by Jane Kennedy, Anne Edmonds and Kitty Flanagan. There were plenty of Eurovision clips and questions with Isaiah as guest quizmaster, who worked beautifully with host Tom Gleisner. The first of what hopefully will be another long season did 808,000. Australian Story featured the Central Australian Aboriginal Women’s Choir with 571,000 watching. Four Corners was a feature from French broadcaster Arte and titled Banksters, which detailed the scandalous conduct of the global bank HSBC. The episode did 541,000 after 511,000 a week ago. Budget cuts at the ABC, how to stage a paparazzi pic and the royal wedding countdown featured on Media Watch for the audience of 448,000. A post-Budget edition of Q&A then did 354,000. After a heady weekend of Eurovision contests and specials it was back to the Monday schedule. Elizabeth: Strong And Steady was on 240,000 after 280,000 a week ago. Olive oil was under the stethoscope on Trust Me, I’m A Doctor with 182,000 watching. 24 Hours In Emergency then did 215,000. Chris Nolan is stepping down from his role as the chief operations officer of Publicis Media Australia and New Zealand. He will leave the agency group at the end of May 2018. 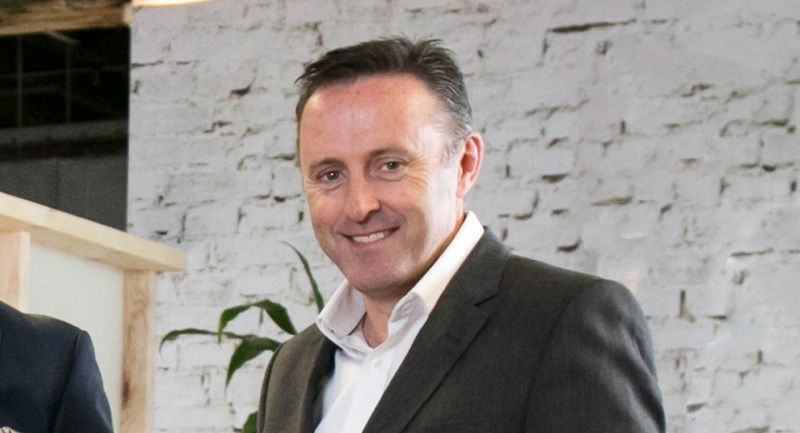 Nolan has been with the agency since 2005, joining Starcom Mediavest Group (SMG) as managing director of the Melbourne office before being promoted to CEO of SMG group and then becoming COO of Publicis Media ANZ in 2016. Nolan is looking to new career opportunities and will be working with Publicis Media ANZ CEO Matt James to transition his responsibilities in the coming month. The COO role will not be replaced. 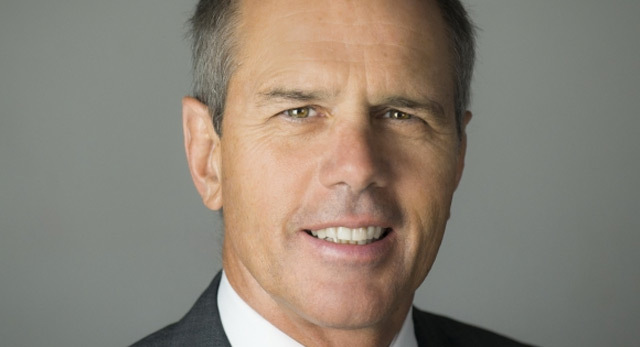 Telstra shares dived to a 6½-year low yesterday after the telco re­affirmed that its earnings were shrinking in the face of increased mobile competition and the impact of the National Broadband Network, reports The Australian’s Supratim Adhikari. The drop in revenue generated means that while Telstra is adding plenty of new customers, the growth in subscribers is coming at a cost. Telstra signed up 60,000 post-paid mobile subscriptions and 36,000 fixed-line customers in the three months to March 31. However, its ARPU for post-paid mobiles slid 3.6% year-on-year to $65.35 for the March quarter. Ten has revealed the editorial team for its new website ten daily, which launched yesterday. 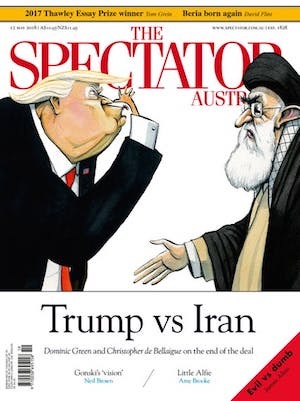 Joining executive editor Lisa Wilkinson, managing news editor Sandra Sully and managing editor Melinda Cornford are deputy editor Chris Harrison, news editor Eoin Blackwell, deputy news editor Rashell Habib, senior news reporter Josh Butler, lifestyle editor Kelly Baker and senior entertainment reporter Mat Whitehead. Contributors to ten daily include Wilkinson, Sully, Waleed Aly, Joe Hildebrand, Hugh Riminton, Sarah Harris, Angela Bishop and Matt Burke. Cornford said: “We’ve established a strong editorial team to launch ten daily. The impressive names, faces and voices behind our compelling content will be what helps set ten daily apart. ten daily is a short-form video-led, stand-alone, mobile-optimised website that covers news, entertainment, lifestyle, food, opinion and sport content. It draws on the resources of Ten, the home of MasterChef Australia, The Bachelor Australia, The Bachelorette Australia, Australian Survivor and The Project. The youngest of Toowoomba’s Wagner brothers has told a defamation trial that he struggled to cope with accusations against his family from broadcaster Alan Jones, citing comments made to his young son that his parents were “responsible for killing people”, reports The Australian’s Mark Schliebs. The four Wagner brothers are seeking up to $4.8 million in damages over 32 broadcasts by Jones. They allege they were defamed by imputations their quarry was responsible for the deaths at Grantham, that they engaged in a cover-up, and had broken the law when building the Wellcamp airport. Jones is expected to give evidence later this week. 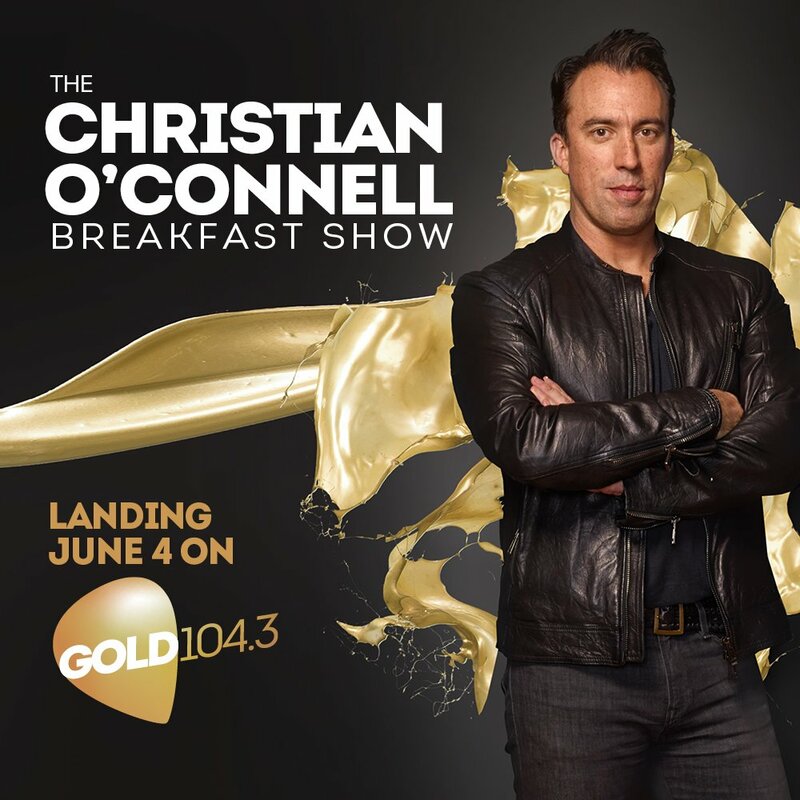 Mayday, Mayday, Mayday… Melbourne’s next breakfast radio announcer, Gold 104.3’s Christian O’Connell, has started his final week in his old job at Absolute Radio in London. In what is possibly one of the longest goodbyes ever in British media (because O’Connell gave his employers such a long period of notice), Absolute has branded his final days The Ultimate Week. O’Connell has hosted farewell live shows and has also treated his colleagues to farewell events. The humour at the live shows was at times pretty raw, with O’Connell saying it would not be able to be broadcast. O’Connell’s final day on air at Absolute is Friday May 18, giving him just two weeks off air before he arrives in Richmond to host his first Gold 104.3 show on June 4. He has been busy searching for a place to stay in Melbourne and has fielded a number of suggestions from listeners over the past few weeks. Part of the final week at Absolute will be spent deciding which song to go out on – something that will be a challenge as O’Connell broadcasts across seven different stations each catering to a different music style. He got the list down to five last week, but added another two over the weekend, his final weekend being spent in the UK. *Mayday, Mayday, Mayday is a reference to a game of Battleships that O’Connell played on air recently at Absolute. It is with great sadness that we bid farewell to one of our cherished Hey Hey family members who passed away from cancer yesterday morning. 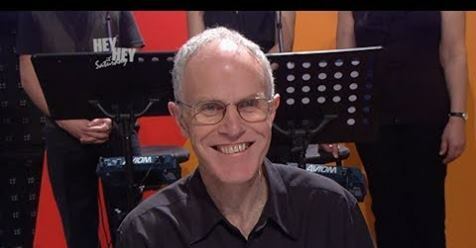 Peter McCutcheon was not only an extraordinarily gifted musician, but the resident pianist on the show for many, many years because he was in tune with the comedic flavour of the program. In the early 80s he was part of our first in-house band: a trio consisting of Wilbur on sax, Animal on drums and Peter on piano. This pre-dated our big band era, in which he also played a major part. There’s nothing inherently wrong in going back to Joan Lindsay’s 1967 novel, in which the inexplicable disappearance in 1900 of a trio of private schoolgirls and one of their teachers at the Victorian geological formation roils all involved, even though it’s already been translated into Peter Weir’s magisterial 1975 Australian feature film. It’s rich source material. The problem is how it’s been adapted for the quality drama era. Opening up the text limits it. What adds to the disappointment is that Foxtel has already made a local drama about a young woman trying to find answers in her unbalanced life amid the dislocating otherness of the Australian bush. It’s called The Kettering Incident and it’s original, incisive and compelling. It aired two years ago and very little in Picnic at Hanging Rock comes close to matching it. Listen to the Mediaweek podcast on Picnic At Hanging Rock where Andrew Mercado and James Manning are joined by FremantleMedia’s director of drama Jo Porter, who is also an EP on the drama series. The British Academy of Film and Television Arts has announced the winners of the Virgin TV British Academy Television Awards, celebrating and rewarding the very best programs and performances of 2017. The ceremony was hosted by Sue Perkins at the Royal Festival Hall, London. 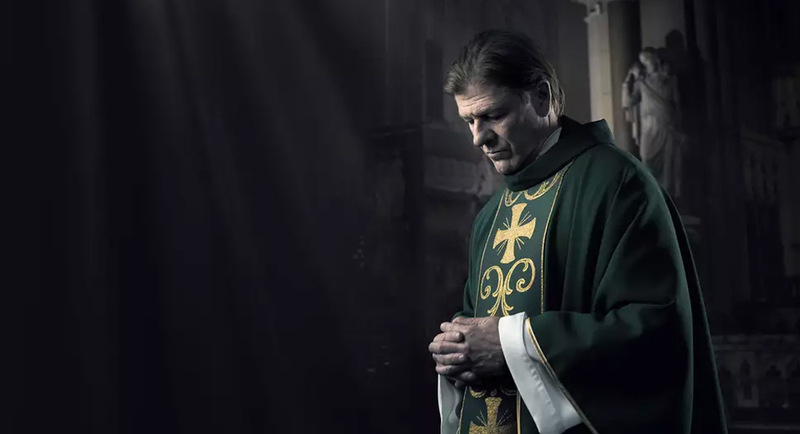 Sean Bean won the BAFTA for Leading Actor for his portrayal of a priest at the centre of a troubled community, in the drama series Broken. Graham Norton won the sixth BAFTA of his career, winning for Entertainment Performance, his third for The Graham Norton Show. 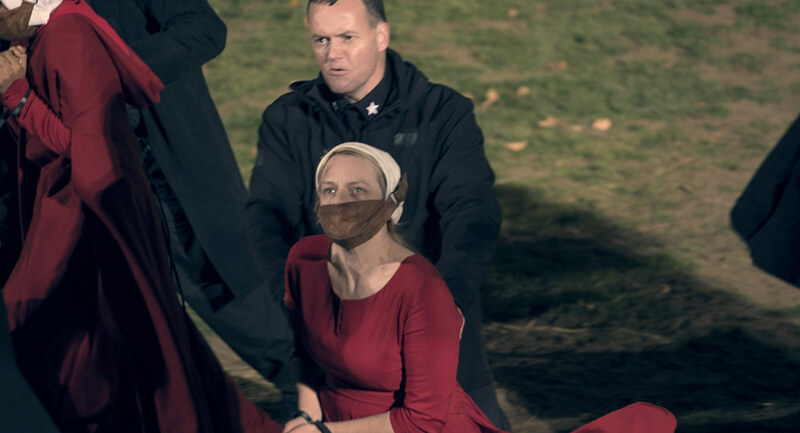 In the International category, the BAFTA was awarded to The Handmaid’s Tale, the adaptation of Margaret Atwood’s dystopian novel. In the drama categories, Peaky Blinders won the BAFTA for Drama Series, and docudrama Murdered for Being Different was presented with the award for Single Drama. Casualty was awarded the BAFTA for Soap & Continuing Drama, a category that recognises exceptional talent in delivering long-running continuing dramas. Casualty last one this award in 2007. The BAFTA for Entertainment Programme was awarded to Britain’s Got Talent for the second time and Murder in Successville, with BAFTA Breakthrough Brit Tom Davis as one of its nominees, received the award for Comedy Entertainment Programme. Ambulance received the BAFTA for Factual Series. 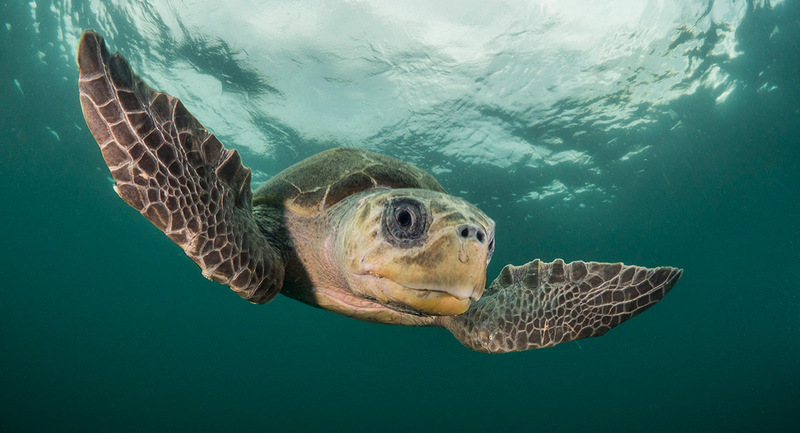 The BBC’s Blue Planet II won the publicly voted award, Virgin TV’s Must-See Moment. See a full list of the winners here. As Brooklyn Nine-Nine ended its current season, the program has continued to rank highly on the Parrot cross-platform audience demand Overall TV charts. The audience interest in the show globally helps explain why NBC jumped on the show after Fox cancelled it. Meanwhile, the Karate Kid sequel Cobra Kai has been performing well for YouTube Red with the series entering the Overall TV chart in Australia at #3. 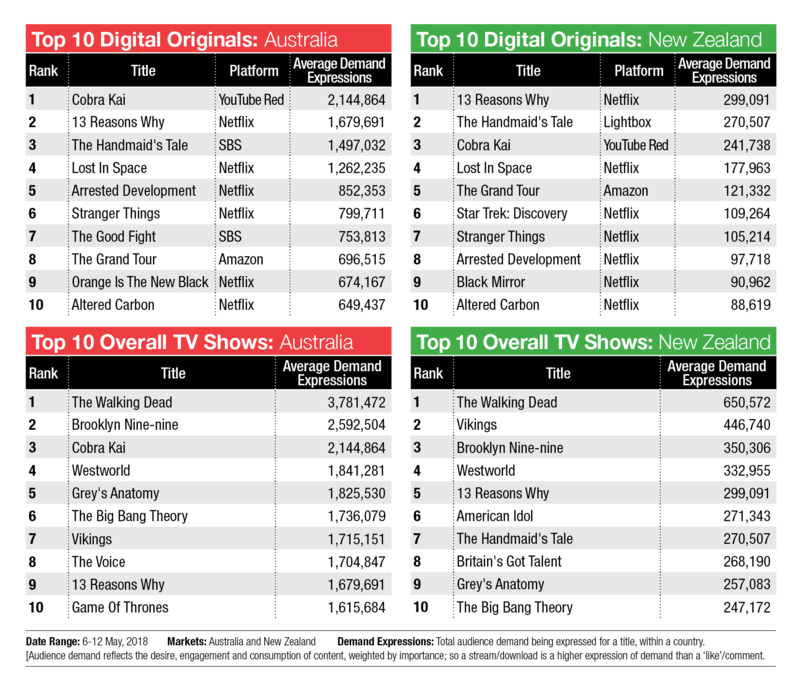 The series also ranks #1 on the Digital Originals chart in Australia and #3 in New Zealand. 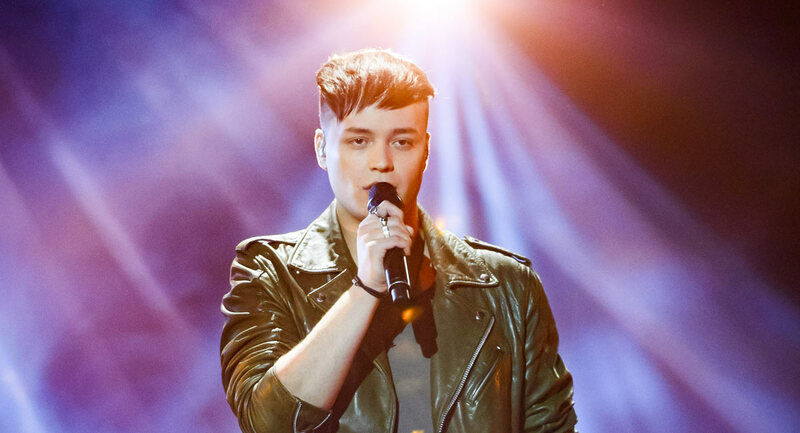 Eurovision has dominated the Non-Sport category this week with close to quarter of a million social interactions for the week ending Sunday May 13. Four channels were represented in the top five with TEN’s MasterChef making an appearance during its first week back in 2018. 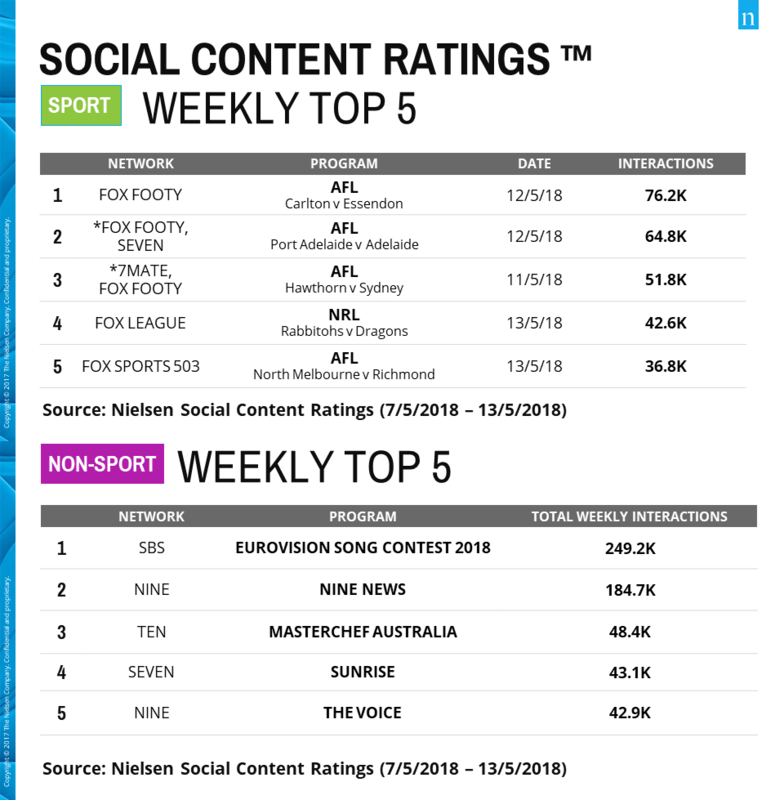 Football continues to dominate the Sport category with AFL on Seven and Fox Footy taking the top three spots on the Nielsen chart. Former Nine Network commentator Shane Warne is expected to sign with Fox Sports this week as the musical chairs rush for commentating positions in the new world of cricket broadcasting reaches its climax, reports The Australian’s Peter Lalor. This development comes as former Test great Mark Waugh, who along with Adam Gilchrist has also signed with Fox, steps down as national selector. Waugh was officially the T20 selector but provided input on the ODI and Test teams as well.